Today — March 14 or 3/14 — is as everyone should know a not very public holiday celebrating all things circular: Pi Day! Traditional rituals involve re-enacting the picnic scene in Harold and the Purple Crayon. But what would be Pi Day on a science blog without a tip of the pixel to some of our less reasoned friends. It’s an urban legend that Alabama’s legislature once tried to assert the rule of law to set pi to 3. It is true that there is are two verses in the Hebrew Bible that seem to say pi is in fact that nice round number — I Kings, Ch. 7 v. 3 and II Chron. Ch. 4 v. 2. In Kings, it reads: And he made a molten sea, ten cubits from the one brim to the other: it was round all about, and his height was five cubits: and a line of thirty cubits did compass it about. But still, it is true that no one ever lost money betting the over on stupid. So, for your Pi Day pleasure, consider Indiana House Bill 246, submitted in 1897. The bill, submitted by someone described as an eccentric mathematician (sic) required that pi be set equal to 3.2. The measure actually past the state House of Representatives by a vote of 67-0. The state Senate fortunately knew stupid when they saw it, and the bill was referred to the Committee on Temperance. (I would have needed a stiff drink before I read the thing), and then killed the measure with a device called an “indefinite postponement” — in which state that overstuffed Indiana pi remains. Friday Newton blogging to come on an alternate day; for now…have a good weekend. 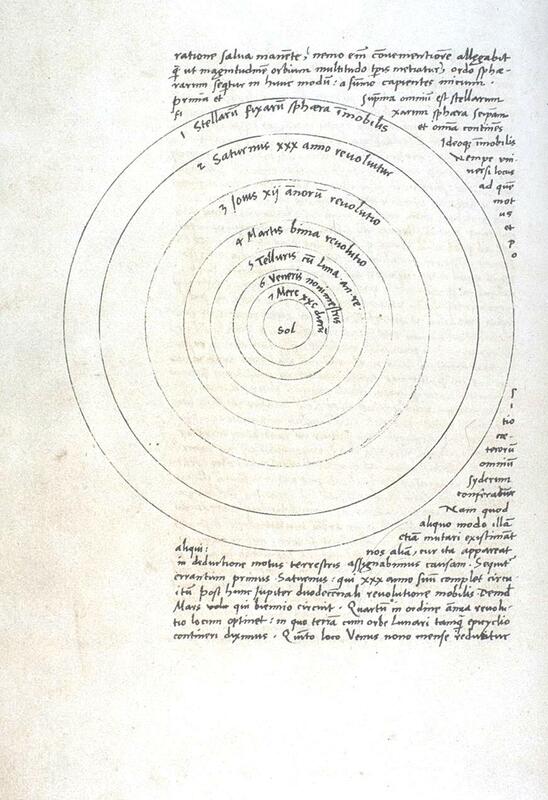 Image: From Nicholas Copernicus, De Revolutionibus, Book I, Chapter 10. Source: Wikimedia Commons. You have got to admit — these are some of the coolest circles in print. This entry was posted on March 14, 2008 at 6:34 pm and is filed under astronomy, History of Science, political follies, random humor, Stupidity, Uncategorized. You can subscribe via RSS 2.0 feed to this post's comments. Terrific circles, indeed. The Latin of the outer circle, “Stellarii fixarii sphaera imobilis” is obvious enough, a vestige of the world view represented in the (English) Bible by the phrase “firmament of stars”. It’s instructive that Copernicus retained the previous error even while casting aside the previous errors about the solar system. This seems to me a classic example of how science works. It finds a truth that it can prove – heliocentricity, and all later theories sustain it, but many of the peripheral “facts”, particularly long-held assumptions, may still turn out later to be wrong as further theories subsume the core truth. I wasn’t feeling irrational enough to celebrate Pi Day.